George Canyon visited the CCMA Gift Lounge in Vancouver on Sept 13/09 during the CCMA Awards weekend. 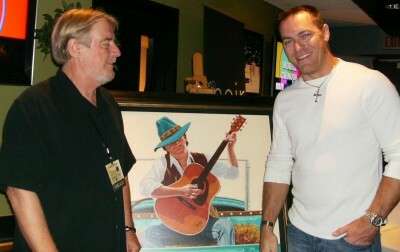 While there, George met famous Artist Chris MacClure from Vancouver, who was displaying a Giclee of his, SERENADE, which is to be auctioned off for the Chrildren's Hospital in Vancouver. About 26 of the CCMA performers signed the piece including George. Chris MacClure, was born in Saint John, N.B. and spent most of his childhood in Moncton. He later moved to Vancouver. Chris is an International Canadian Artist. 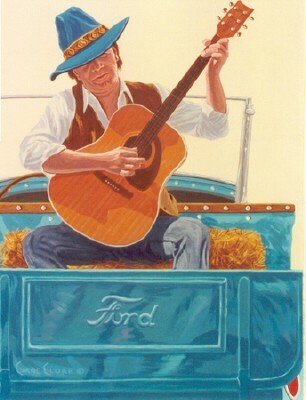 His paintings can be found in many corporate collections worldwide. Some collectors include, John Travolta, Kirstie Alley, James Whitmore, Bill Clinton, Boris Yeltsin, Pepsi Co and the Ford Motor Co of Detroit, to name a few. Chis spends his time at his Los Cabos. Cabo San Lucas, Baja, Mexico and his White Rock, Surrey, B.C. studio. Chris's work can be seen on his website: www.chrismacclure.com. There you will be amazed with his paintings which are breathtaking. Visitors can view photos, Prints, Resort shows, Visit his gallery, current price values , The Ford Collection and much more.